The Chosen: Fellows 2015 announced. 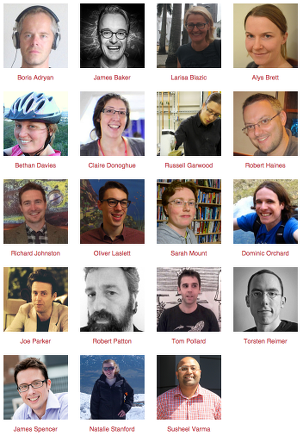 The Software Sustainability Institute Fellows for 2015 have been announced. Their profiles are available for your delectation. After 73 applications, 15 reviewers, two rounds, presentations, statements, discussions and over 500 reviews we finally have chosen our selection of 19 Institute Fellows for 2015. It is to be noted that we set out for 15 but due to the quality of applications and intense competition we had to increase the numbers of places available. Our Fellows are both leaders in their research fields and people who understand the importance of software in research. They are engaging people who want to promote best practice, training and interdisciplinary working with a focus on software. Our new Fellows come from a variety of fields from Genetics, Digital History, Art and Design, Research Software Engineering & Management, Glaciology, Healthcare, Imaging, Material Science, Computer Science, Addiction studies, Data Management, Chemistry, Systems and Synthetic Biology and collaborative scientific analysis and services. The Fellows have many plans. From taking part in key workshops and conferences in their domains; running training events at their institutions or for their domains; organising interdisciplinary and software-focused workshops to improve practice and bringing key people together for better research. You will be hearing more from them in 2015 and beyond. Please give a warm welcome to our new Fellows 2015.